"Train to Busan" main cast and director will walk the red carpet of Cannes International Film Festival. 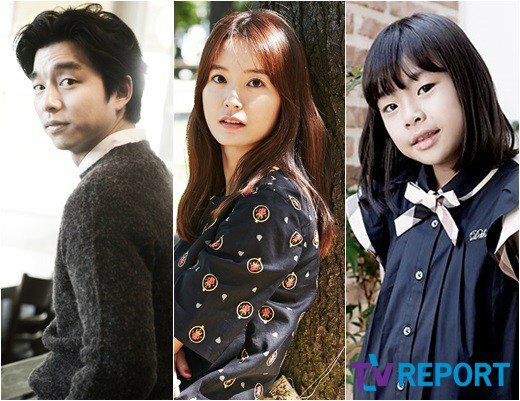 Movie "Train to Busan" actors Gong Yoo, Jeong Yu-mi and Kim Soo-an as well as the film director Yeon Sang-ho will depart to Cannes, France on May 12th. The will also attend the official red carpet event of the 69th Cannes International Film Festival on May 13th (local time). "Train to Busan" has been invited to the Midnight Screening event of Cannes International Film Festival this year. The blockbuster film is about the struggles to survive of the people who went on a KTX express train to Busan from Seoul, while the zombie virus seized the entire Korea. Jeong Yu-mi was invited to the Cannes Film Festival in 2012 for her role in Hong Sang-soo's "In Another Country", which was invited to the In Competition section. However, she did not attend the festival at the time. Ten year old child actress Kim Soo-an will the youngest one among all Korean actors, who attend the red carpet event of the Cannes International Festival. This is the second time for director Yeon Sang-ho to be invited to Cannes after his animation, which was invited to the Directors Fortnight section at the 65th Cannes International Film Festival. "Train to Busan" is opening in July in Korea. Choi Woo-sik continues to go from strength to strength as an actor. 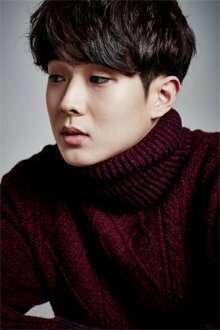 Last year, he won several awards for his role in "Set Me Free", becoming one of the most sought-after rookies in the film industry. This year, he hopes to further captivate audiences with a couple of films in the offing. Choi's latest film, "Train to Busan", directed by Yeon Sang-ho, will be shown out of competition at this year's Cannes Film Festival in May. Choi also appears in the soon-to-be-released romantic comedy "Marital Harmony", and is currently working on a new project. The disaster film "Train to Busan" tells the story of passengers on a train who struggle to survive amid a mutant virus outbreak. The main stars of "Train to Busan" will make appearances in support of the new movie from director Yeon Sang-ho at this year's Cannes Film Festival, which kicks off on May 11. The movie has been invited to screen out of competition in the festival's Midnight Screenings section. It tells the story of passengers on a bullet train bound for the port city of Busan as a disastrous virus strikes Korea. Yeon and actors Gong Yoo, Jung Yu-mi and Kim Soo-an will travel to the French city to walk the red carpet and attend the movie's world premiere at the festival. "Train to Busan" will be released here in the summer. The cast and director of movie “Train to Busan” will walk the red carpet at the 69th Cannes Film Festival this year. 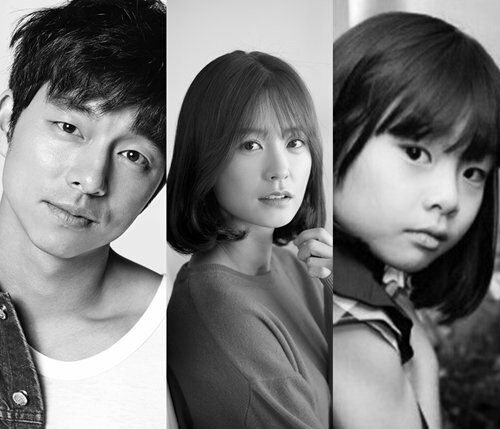 Lead actors of the movie, Gong Yoo, Jung Yoo Mi, and child actress Kim Soo Ahn, and director Yeon Sang Ho have been invited to the festival’s Midnight Screening, and will attend the world premier and red carpet events taking place from May 11 to May 22. Director Yeon Sang Ho previously attended the 65th Cannes Film Festival for his animation film “The King of Pigs.” After gaining recognition for his talented story telling and visuals through the film, Yeon Sang Ho has been invited to the festival for a second year in a row for his first live-action movie “Train to Busan.” Yeon is the first filmmaker in Korean film history to be invited to the Cannes Film Festival for films in both animation and live-action categories. The performances of veteran actors Gong Yoo and Jung Yoo Mi alongside Yeon’s direction produced an incredible work worthy of anticipation. The plot for “Train to Busan” revolves around passengers who are desperately struggling to survive on a KTX train racing towards Busan when a disaster hits Korea. The film is set to premiere this summer. Given the film’s achievements and recognition before its release, “Train to Busan” is certain to be a summer blockbuster you can’t miss! The views on official Naver Movie TVCast keep increasing. Let's watch the trailer there too. Launching trailer of movie ‘Train to Busan’ was revealed. On May 9th, the production team of movie ‘Train to Busan’ released Launching trailer. ‘Train to Busan’ is going to evolve around people who run into a tragic disaster while traveling to Busan on KTX. The launching trailer starts out by showing people boarding the train to Busan at Seoul Station, and moves on to show the people struggling to survive from the disaster. The incident commences with an ambush of unidentified figures, and the situation quickly spreads to surrounding areas. Gong Yoo, Jugn Yoo Mi, Ma Dong Seok, Choi Woo Shik, Ahn So Hee, Kim Eui Sung, and Kim Soo Ahn have played in the film as lead roles, and a great number of movie fans are showing even greater anticipation for the film now. ‘Train To Busan’ is a new film directed by director Yeon Sang Ho, and the film is getting a great number of high compliments from global movie fans already. ‘Train To Busan’ was invited to ‘The 69th Cannes International Film Festival’ recently, and Gong Yoo, Jung Yoo Mi, and Kim Soo Ahn will attend the festival together soon. Meanwhile, ‘Train To Busan’ will be officially released in summer 2016. On May 12, actor Gong Yoo was spotted at Incheon International Airport departing to France for the 2016 Cannes Film Festival. Gong Yoo looked to be in good spirits as he waved to fans. He was dressed in a all black fashion, but wore short sleeves to match the warm weather. Gong Yoo accessorized the look with dark sunglasses and white sneakers and styled his hair wavy. Meanwhile, Gong Yoo will be walking the 2016 Cannes Film Festival red carpet with fellow cast members from the movie Train to Busan. Yeon Sang-ho, who drew raves for his Cannes title 'King of Pigs', returns to the Croisette with a midnight screening of his new zombie thriller. Though South Korea has seen plenty of movies based on "webtoons" or online comic strips, never before has an animated feature received a live-action sequel. That’s exactly what South Korean animator Yeon Sang-ho, 38, is bringing to Cannes, where his apocalyptic thriller Train to Busan will receive a midnight screening on May 13. The film is a sequel to Yeon’s animated feature Seoul Station, which opens in South Korea in August. In a strange twist of fate, Train to Busan actually will hit theaters in July, one month before Seoul Station. That’s right: Train to Busan is a live-action sequel to an animated film that hasn’t even been released yet. So how did this happen? It all started when Kim Woo-taek, CEO of South Korean distributor Next Entertainment World, saw an early cut of Seoul Station and was so impressed that he asked Yeon if he’d be interested in making a live-action version of the film. Despite the fact that he had never worked in any medium outside of animation, Yeon jumped at the chance — with one caveat: He wanted to make a sequel. "I don’t differentiate between animation and live-action movies," says Yeon. "They’re all movies to me. So when [Kim] suggested that we do a live-action version of Seoul Station, I thought it would be redundant for the same director to make two versions of the same movie. So I suggested doing a sequel, but because of the release date, the original [animated] film will now be a prequel." Both films look at the aftermath of a virus that sweeps through Seoul, turning average citizens into zombies. While Seoul looks at what happens inside a train station, Busan exclusively focuses on the passengers of a bullet train. Like his previous film in Cannes, the animated Directors’ Fortnight entry King of Pigs — an unsettling look at the lifelong effects of bullying and class distinctions in South Korea — Train to Busan does not shy away from humanity’s darker impulses. "It zooms in on the psychology of people dealing with a crisis," he says. "It becomes very personal, and some normal-looking people turn into monsters." Yeon, who considers Hayao Miyazaki a key influence, is credited with pushing the boundaries of the Korean animation industry, where successful franchises largely have been limited to TV serials for children. Given his background in un inching animated fare like King of Pigs, Yeon says he never thought he’d make a movie as commercial as Train to Busan. But making the transition to live-action filmmaking is something he has come to embrace. Its like WOW.....so intense and impressive. .....looking forward to this. .....Good work everyone......FIGHTING! It is quite rare for a blockbuster film to get screened at the 'Midnight Screening Section,' and a great number of movie fans ares showing huge anticipation from all over the world already. Prior to the official screening, Gong Yoo, Jung Yoo Mi, Kim Soo Ahn, and director Yeon Sang Ho are going to attend the opening ceremony. Meanwhile, 'Train To Busan' evolves around a group of KTX passengers that run into a tragic disaster while traveling to Busan from Seoul, and it will be officially released in Korea in July. Actor and actress Gong Yoo and Jeong Yu-mi of "Train to Busan", which has been invited to the Midnight Screening section of the 69th Cannes Film Festival, are attending the premiere screening at Lumière Theatre in the afternoon on May 13th local time in Cannes, France. 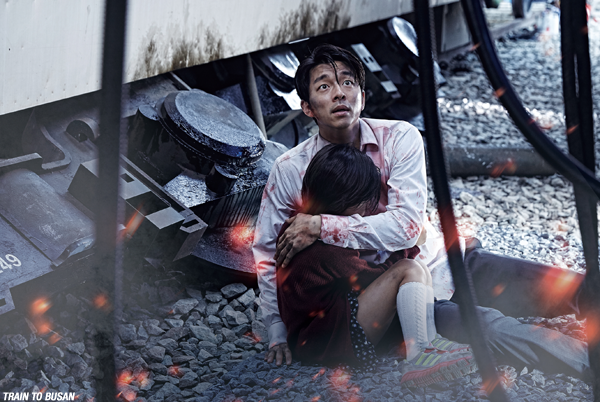 "Train to Busan" starring Gong Yoo, Jeong Yu-mi and Ma Dong-seok is a film by director Yeon Sang-ho. The blockbuster film is about the struggles to survive by the people who went on a KTX express train to Busan from Seoul, while the unprecedented zombie virus seized the entire Korea. "Train to Busan" is coming to the theaters in July in Korea. Chansung of 2PM tweet about this movie. Hope he will go watch it when it airing in Korea. Photos of Gong Yoo and Jung Yoo Mi in Cannes have been revealed. On May 14th, management agency of Gong Yoo and Jung Yoo Mi's management agency uploaded photos of the two in Cannes on the company's official Instagram. They wrote, "We are now at the Cannes International Film Festival, and the audiences made a standing ovation after the premiere of 'Train To Busan' last night." They also wrote, "Gong Yoo showing a heart for his fans, Jung Yoo Mi looking gorgeous in a black dress, director Yeon Sang Ho, and Kim Soo Ahn. It was a fabulous Friday, the 13th." The photos show Gong Yoo, Jung Yoo Mi, and Kim Soo Ahn posing together at Cannes International Film Festival, and many people are showing particularly hot reactions for Gong Yoo's sharp look in black suit. Meanwhile, 'Train To Busan' will be officially released in summer 2016. Some of Korea’s top actors gathered for a few beers at one of the world’s top film festivals. On May 16, Syd Lim (Lim Seung Yong), the CEO for Yong Films that produced “The Handmaiden” updated his Instagram with a picture from France. Currently, the actors from “The Handmaiden,” directed by Park Chan Wook and “Trip To Busan,” directed by Yeong Sang Ho, are in Cannes, France for the Cannes Film Festival. In the photo, you can see the four actors looking chummy as they enjoy their time broad. Their individual personalities show in their different poses, ranging from Gong Yoo‘s gentle smile to the cute V shown by Jung Yoo Mi to Jo Jin Woong who is goofily staring off into space. In addition to “The Handmaiden” and “Trip to Busan,” another Korean film “The Wailing” is also being shown at Cannes, demonstrating just how much the Korean film industry has truly established itself in the world. Gong Yoo, Jeong Yu-mi, Ma Dong-seok, Ahn So-hee, Choi Woo-sik's "Train to Busan"
The cast of "Train to Busan" talked about how they got to star in the movie. "Train to Busan" is a blockbuster about a group of people on the KTX train struggling for survival while an unprecedented natural disaster hits Korea. "Train to Busan" started off with a lot of attention as the director had come up with a new element for this movie and the scenario was outstanding. The cast is also made up of the greatest actors and actresses. Gong Yoo stated the reasons he chose "Train to Busan": "This new element for the movie will create synergy and it's something you have never seen in Korea before". Gong Yoo has starred in various movies from "The Crucible" and "The Suspect". He claimed he felt the success of the movie just by looking at the scenario. Jeong Yu-mi, Ma Dong-seok and Choi Woo-sik mentioned the movie's intensity and appealing characters as their reason for starring in the movie. Jeong Yu-mi said, "I loved the scenario and how intense it sounded". Choi Woo-sik mentioned the turning point of the movie and Ma Dong-seok said, "I fell for characters that are full of humanity. This action is different from the other action movies I've done". Lastly, the cast has never ending faith in the director Yeon Sang-ho. Ahn So-hee said, "Director Yeon Sang-ho is a good reason enough to star in "Train to Busan". Kim Ee-seong said, "He has a stance and he is perfect in his direction". Kim Soo-an said, "The director told me to do what I liked to do and he monitors me thoroughly". Well Go USA Entertainment has acquired North American rights for “Train to Busan,” a zombie apocalypse thriller that premiered at the Cannes Film Festival in the Midnight Screenings category. Yeon Sang-ho (“The King of Pigs,” “Fake”) directed from a script by Park Joo-suk. The story follows a group of terrified passengers fighting their way through a countrywide viral outbreak, trapped on a suspicion-filled, blood-drenched bullet train ride to the Safe Zone. The film stars Gong Yoo (“The Suspect”), Jung Yu-mi (“Silenced”) and Ma Dong-seok. A theatrical release is planned for the US and Canada in late July, closely following the film’s home-country release. The first Korean film to screen at the Cannes Film Festival, where it was invited as a Midnight Screening, was TRAIN TO BUSAN. The first live action feature from YEON Sang-ho, the acclaimed director of indie animations The King of Pigs (2011) and The Fake (2013), TRAIN TO BUSAN, which met with a rapturous response from critics and standing ovation during its gala premiere at the Lumiere Theater at the Palais des Festivals, is poised to be one of this summer’s biggest Korean films when it goes on release domestically in August. The film stars GONG Yoo as a divorced successful hedge fund manager whose neglected daughter asks him to bring her down to Busan on her birthday to visit her mother. Just as they board the express train in Seoul Station down to the port city, a zombie outbreak descends chaos on them and their fellow passengers. On a sunny Saturday afternoon in May, the team for TRAIN TO BUSAN visited the Korean pavilion (operated by the Korean Film Council) by the sandy beach of the Croisette during the Cannes Film Festival. KoBiz was briefly able to sit down with the cast members of the film in town for the premiere, which included GONG Yoo, JUNG Yu-mi and KIM Su-an, each of whom were attending Cannes for the very first time. KoBiz: This is the first time for all of you in Cannes. How has the experience been for you? GONG Yoo: Actually, this has also been my first time at a foreign international film festival, not just Cannes. So it has been very exciting, especially the first time I watched a film at the Lumiere Theater in the Palais des Festivals. It was really a thrilling experience. KIM Su-an: From my hotel, if you look outside it feels like we’re here on a big movie set. It’s very romantic and although I’ve already been able to visit many places I think that this is my favorite city now. JUNG Yu-mi: At first I was very nervous about being here but once I finally arrived I then realized that it actually felt very similar to the Busan International Film Festival. At this point I think I’ve begun to feel quite comfortable about it. KoBiz: You’ve already worked on so many films, Sprout (2013), Hide and Seek (2013), etc, but how was your experience on a big disaster film set? KIM Su-an: Well I already shot the commercial films Hide and Seek and Coin Locker Girl last year but TRAIN TO BUSAN was really the warmest welcome I’ve ever had on a set. KoBiz: You made one action film in the past (The Suspect, 2013). This year you have both TRAIN TO BUSAN and The Age of Shadows. Are you trying to expand your image in cinema? GONG Yoo: I didn’t choose this film as a way of adapting my image or in order to show a new side of myself. Instead, I chose it because it’s the first zombie blockbuster in Korea and I think it’s meaningful to try new things in cinema. However, at the same time, if I’m able to show different aspects of my character and of my acting styles, I also find that to be very satisfying. Kobiz: Out of all the characters in the film, yours is probably the most calm, even ironically so, given that she’s pregnant. However, if you found yourself in that same situation, what do you think you would do? JUNG Yu-mi: I probably would have jumped out of the train! (laughs) Actually I thought about that and honestly if I were ever to be in the same situation as in the film I think I would have done more or less the same thing. Although I’m not sure I would have made it all the way to Busan. At some point along the way I’m sure I would have faltered and been taken out. KoBiz: There’s an important scene in the film in which you both sing a song and begin to shed some tears. What were you thinking the moment you filmed that? KIM Su-an: While we were on location, we had to do over 20 takes, both because of the CGI work they would do later and also some focus problems. But when I had to cry for the scene I thought about how I would feel if my own mother were to pass away. I’m very close to my mom. KoBiz: Compared to other characters in TRAIN TO BUSAN, your protagonist undergoes the most change. Beginning as a financier with little regard for others but eventually turning into a hero. What did you do to show that change on screen? GONG Yoo: Rather than calculating how I should act, all I needed to do was to connect with Su-an to see how she was reacting to me. It became very natural to change my character through the different situations in the film. This happened quite simply through showing a father’s love. South Korea’s latest blockbuster <Train to Busan> is looking to be a chart topper for this year and possibly in the pantheon of Korean films. The film had its premiere in the Midnight Screenings section at the 2016Cannes Film Festival in May and has been abuzz with hype ever since. 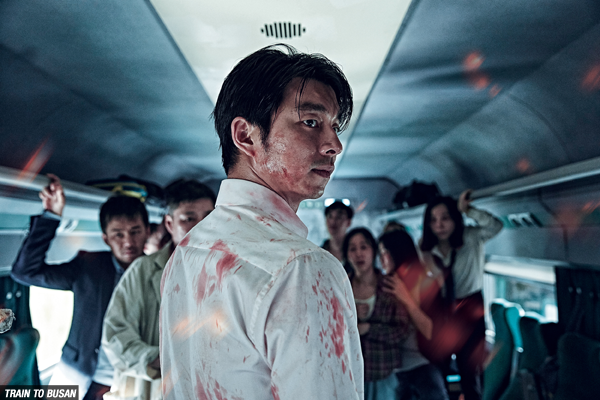 Starring the award-winning actor Gong Yoo, the film follows a crew of survivors on a crazy KTX (Korea Railway) ride from Seoul to Busan in the midst of a zombie apocalypse. Writer and Director, Yun Sang-Ho keeps the movie like the motion of the train, relentlessly pushing forward. Sang-Ho is a new to live-action, his last three projects all indie anime features [<King of Pigs>, <Fake>, <Seoul Station>]. However, his transition from animation seems nearly flawless. Even more surprising is Korea’s lack of contribution to the zombie drama. Korean zombie flicks number less than five. However, in the wake of last year’s MERS outbreak on the peninsula and the corruptive negligence of the government and elite class, it is easy to see Sang-Ho’s intentional illustration of that gap. The opening scenes connect to his last film <Seoul Station>, showing the homeless and depraved that gather at Seoul Station. In addition, Suk-Wu (Gong Yoo, represents this class, pulling the rug out from underneath the typical zombie film protagonist hero. He closes the doors on suffering passengers and scorns others for giving up their seats to the elderly. It is left to his young daughter, the youth to force change upon the stagnancy and apathy of this un-empathetic tier. Subverted, raw and absolutely thrilling <Train to Busan> is sure to impress as it did at the Cannes Film Festival. It’s premiere date in Korea is set for July 20th. Following the photo shoot for 'Marie Claire', Gong Yoo talked about his upcoming movie 'Busan Bound' and drama 'Goblin'! The actor revealed the reason he decided to join 'Busan Bound' as he said, "I wanted to try the things that other people have not and also wanted to portray more of the character 'Suk Woo' than how he was written in the script." As for the drama, he expressed strong passion. Gong Yoo said, "I will give all of my mind and body to act without boundaries." Meanwhile, Gong Yoo's new movie is set to premiere starting July 21 and his drama in November. What's Sohee's reaction when Choi Woo Sik suggests making a heart together? On June 21, actors and actresses from upcoming zombie thriller film 'Train to Busan' attended its press conference! During their photo time, actor Choi Woo Sik accompanied Sohee and attempted to make a heart with her above their heads! What was Sohee's reaction? Added new posters for the upcoming Korean movie "Train to Busan"